Your brand is possibly the most important thing you can convey to your customers. It is a window into the identity and character of your business. Branding should convey your mission statement, your values, create trust and tell the world who you are. What Elements Makes up a great Brand? Imagine your company logo as the icon on the desktop that stands out, the one that you always click. When customers pick out your products and services, among all the competitors in the market, this is what happens. Your brand must be instantly recognizable. In order to capture business from your competition, your business needs a unique identity. A brand that can help your customer’s identify your Unique Selling Proposition (USP). Thus branding and logo design are imperative steps for any business. Mindtrust clients choose from a wide variety of color palettes that convey their business philosophy. Mindtrust also assists your team in helping share the word of mouth via exquisite business card and letterhead designs that stand-out. Domain acquisition is easier when you have Mindtrust to consult for your branding and logo design. Event design, PR and Media relations become easier and thematic to your branding appearance and logo design. Campaign video creation is revolutionized up to the current market standards thanks to Mindtrusts veteran branding and logo design team of experts. One of the biggest challenges to building a small to medium sized business is creating a brand. Your brand helps consumers to identify your business, and it has to stand out enough to compete with the big corporations. Branding and marketing that brand is one of our specialties. You will find it hard to compete in today’s world without a strong brand. It isn’t enough to provide great products and services. You have to become memorable and help consumers find you. 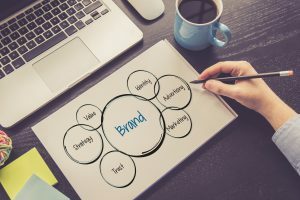 Your brand is what sets you apart and should stick in the minds of your consumers so that they think of you first when they need your products and services. Creating a brand starts with making your business unique. What features and benefits does your business offer that is different from the competition? Once you find your niche, you can create a header that conveys this branding and sets your business apart from the competition. Your logo really needs to stand out and convey a message. Many small businesses start out using a variation of the company name. This works in a pinch, but doesn’t go very far toward branding your business. Our services provide you with a logo that really sets you apart and makes clear what your business has to offer. In creating a great logo, you really need to take a look at the available color palette. Colors used should be vibrant and relate to your products or services. You can also use the color palette to invoke a certain emotion. There is a science to choosing the correct colors based on the message you want to convey and the emotions or thoughts you want to inspire. We offer a large color palette for creating your brand that will convey any message to place you firmly in your niche.